Who Delivered the First Pizza? For thousands of years, humans had to venture out into the dangerous, life-threatening wilderness for their next meal. Today, it takes a little more than lifting of a thumb for a gourmet meal to be delivered straight to your door - no, bow and arrow required. Now, that’s progress. With the recent launch of UberEats in 10 major US cities, the food delivery business is continuing to grow. But pizza remains king of delivery, with over one billion pizzas delivered a year. How did it all begin? When was the pizza first delivered? While there’s some dispute over whether pizza was actually invented in Naples, the Italian delicacy certainly gained popularity in the seaside working class town. Cheap, easily prepared and able to be eaten quickly, pizza was the food choice for nearly every meal for those living on a limited budget. Often topped with cheese, oil, lard, tomatoes, garlic or tiny fish, pizza during ancient times wasn’t all that different from what we eat today. There’s certainly some irony in the fact that Italian nobility often called pizza “disgusting” and food for the poor, but today there’s such a thing as a thousand dollar New York pizza (at least until the pizzeria that served it closed a few years ago). In the mid-19th century, Italy unified and was established as a kingdom. This brought together previously separated regions and states, spreading foods that were once confined to small towns across the country. From cannoli to lasagna to pizza, what we now think of as “Italian food” really came from this era in Italy’s history when blending and mixing of traditions produced a menu of options. Despite this, Naples pizza wasn’t particularly popular outside of the city. That seems to have changed when the Italian King and Queen first paid a visit to the city in 1889. In 1878, Queen Margherita became the first queen of a united Italy and married her first cousin Umberto (after his first choice for a wife died after accidentally lighting her own ball gown on fire). As the first royal couple of the newly integrated Italy, their main job was to hold the country together and prevent revolution. Often taking trips across Italy to gain the support of citizens and boost morale, they arrived in Naples in 1889 in hopes of quelling the unrest there. The legend goes that the Queen had grown tired of eating “fancy” meals, which were often French-inspired due to France’s long relationship with Italy. One night, she demanded a meal of local faire, one fit for a commoner. So, Naples’ most well-known pizza chef and owner of Pizzeria Brandi Raffaele Esposito was summoned and told he must deliver pizzas to the royals’ quarters. Esposito got to work with his wife, making three different kinds of pizza, including one with white mozzarella, green basil and red tomatoes that was intentionally the colors of the new Italian flag. The moment they came out of the oven, he rushed over with the pizza and hand delivered them to the Queen, completing what was perhaps the first pizza delivery in history. Queen Margherita took one bite of the flag-colored pizza and declared it one of the best things she had ever eaten. 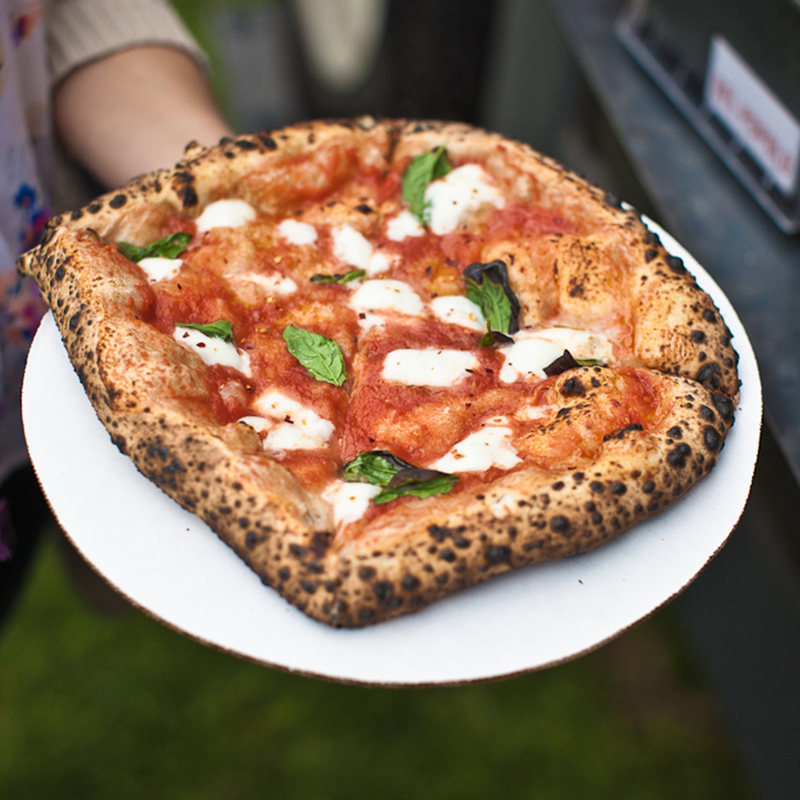 A few days later, Esposito received a letter from the Head of Table Service of the Royals’ Household which read, “Most Esteemed Raffaele Esposito, I confirm to you that the three kinds of pizza you prepared for Her Majesty were found to be delicious.” Smitten, Esposito named the mozzarella, basil, tomato pizza after her - Pizza Margherita. Today, the pizza shop Esposito once owned - Pizzeria Brandi - is still operating in Naples. In fact, there’s now a second location in the bustling pizza market of the United Arab Emirates and the owners are currently looking for franchise opportunities in the United States. Although it is unclear if they still provide pizza delivery.